That particular passage in Harry Potter has always resonated with me, and never more so than after seeing the latest episode of New Girl. “The Box” is an episode that raises an interesting question: how do you know if you’re a good person? Schmidt spends the entire episode begging for the approval of others. He NEEDS them to affirm that he is good because he feels like he is not. But Schmidt doesn’t get the answers that he wants in this episode, and that is mostly because he spends the entire time asking the wrong question. And we, too, spend our entire lives fixating on this same incorrect question. The question that we asks ourselves shouldn’t be “am I a good person?” Because the truth of the matter is that this question is rooted entirely in comparison. Being a “good person” is comparative. I, for instance, am certainly a “good person” when I compare myself to a convict on death row. But I’m not, perhaps, a “good person” when I compare myself to a pristine nun or missionary. This question is entirely based on comparing ourselves to others. “Well, I’m not as bad as THAT person,” we argue. Asking this question, though, allows us to give ourselves a false sense of self-worth and security. As long as we are better than someone else, we reason internally, it doesn’t really matter if we are “good” or “bad” – we just have to be better than the next person. “The Box” focuses a lot on this idea of being good – of being a “good person” or a “good steward” or a “good, functioning human being.” We’ve always known Nick Miller to be a bit immature. Okay, we’ve all known him to be VERY immature. It’s not that he’s stupid. It’s not that he doesn’t know better. He does, I would argue. He’s just lazy. His box is both physical and metaphorical. If I’m being honest with myself, I have totally put people and situations and feelings into a “box” and shoved it into the recesses of my mind. It’s easier to place your bills in a box and shove them into the back of your closet. That prevents you from seeing and dealing with them. It’s easy to shove your problems into a box, too. It’s easy to bury the issues you know that you need to deal with and tuck them far away. Dealing with bills, problems, and emotions is difficult. It might even be painful. Nick doesn’t like confrontation (remember that this theme keeps cropping up this season) and confronting his box is the last thing he wants to do in this episode, not because it requires money. Nick doesn’t want to confront his box because doing so means he has to confront every time he has failed. That box is a constant reminder of his shortcomings – every unpaid bill, every failed project, every lost cause is documented and stored in that box. It’s understandable, then, that Nick wants to keep that part of himself, that extension of himself, as far away as possible from everyone. If he can’t see it, it doesn’t exist and he won’t have to deal with it. Right? And if Schmidt can convince himself that he’s a “good person,” then he won’t have to actually deal with the guilt and anguish over what he did to Cece and Elizabeth. Right? Nick and Schmidt have Jess and Winston, respectively, to instruct them and help them grow as individuals. And by the end of the episode, I think that all of these characters have a better understanding of what it means to be good, what it means to be stable, and what it means to grow. I’m not one to read a lot of reviews before I write my own. It’s a strict rule that I enacted when writing my Community reviews, mainly because I never want a) my own opinions to be unconsciously formed by reading another person’s review and b) my writing to accidentally resemble or plagiarize someone else’s. I have only skimmed reviews of “The Box,” but I recognize that a lot of people didn’t care for the episode. Some even downright hated it. I didn’t hate this episode of New Girl by any means. There are actually very few episodes of television that I hate (“The Art of Discourse,” I’m looking at you), but I can understand the frustration that viewers may have had with both the subject matter and the characters’ response to it. Schmidt’s cheating arc has left a bitter taste in the mouths of a lot of viewers. And while I, for one, was intrigued by how the story would develop Schmidt as a character, I was also glad to see it come to an end. The criticism I heard this week was about Nick Miller, however. Alan Sepinwall didn’t care for the portrayal of Nick as lazy and callous toward Jess who, as I’ll discuss soon, was just trying to aid her boyfriend in becoming a better and more functional adult. He noted that when Nick Miller ruins things by himself, it’s hilarious. But as soon as another person, or multiple people, factor into the equation, suddenly it becomes significantly less funny and actually, Sepinwall argues, Nick appears to become a jerk. While I can understand his reasoning, as well as the arguments of the Tumblr users who cry “character assassination” because Nick would – in their minds – never act that selfishly, I also know that nothing brings out the worst in a character like fear does. Just as Schmidt’s behavior derived from his own selfishness, Nick’s behavior in this episode stems from that self-preservation instinct I noted earlier. Nick isn’t a bad person (recall that the whole point of this episode isn’t to ask that question) – he makes a bad decision by refusing to grow up. But just because Nick exemplified his tendency to act selfishly when hurt and we haven’t seen that side of him recently doesn’t necessarily mean that it is out-of-character. As I’ve argued over the past few weeks, Schmidt’s behavior – while uncomfortable – is completely in character. What’s important, then, is that these characters learn WHY their behavior is unacceptable and rectify it. And I believe that Nick understands the necessity for him to start growing up and making difficult decisions. Truly, he recognizes the fact that if he doesn’t grow and change, he might lose Jess. And losing Jess is the one thing he’s – repeatedly – noted that he cannot bear to do. But it’s more than that, actually. It’d be easy to have Nick only want to grow or change because Jess encouraged him too. And though I believe Jess’ encouragement IS a motivation for his behavior, Nick is also determined to become a better person – a braver person. He wants to, I believe, reconnect with the guy who kissed Jess in “Cooler.” He doesn’t want to stay on the beach and hold wallets anymore. But with living and growing also comes responsibility and that’s something he has to accept. “The Box” opens with Winston noticing Schmidt’s baggy eyes and disheveled appearance. The latter notes that he hasn’t been able to sleep and can’t even bear to look at himself in the mirror anymore. Schmidt is plagued with guilt over what he’s done to Cece and Elizabeth (and to his roommates, I think, as well), but doesn’t know how to move forward. Instead of examining his decisions and judging the choices he made and the lies he told, Schmidt asks the wrong question. He wants to know if he is a good person. I don’t believe that Schmidt is necessarily trying to justify his actions regarding the two women, though, at least… not entirely. I think that what he is attempting to do is feel some sort of peace. He wants to believe that he’s still a good person, deep down, even though he’s wracked with guilt and ruined lives. He NEEDS to believe that. Because if he doesn’t believe that, it means he has to accept the fact that he isn’t who he thought he was. And how do you deal with trying to determine who you are, fundamentally, when you’ve spent thirty plus years assuming you’ve already known where you stand? Interestingly enough, Winston is the only one not to comment on whether Schmidt is a good person or not (and provides insight at the end of the episode). Nick laughs while affirming that Schmidt is a terrible person and Jess – still harboring understandable anger – calls him out, again, for cheating on her best friend, thereby proving Schmidt with the answer he didn’t want to hear. Schmidt tries to defend himself. He tries to compare himself to Winston. He expresses his anger and frustration and tiredness. And really, we know that all of these emotions are directed at HIMSELF. Schmidt is frustrated and distraught internally. He just doesn’t know how to process those emotions and instead projects them on the people around him (much like we saw in last week’s “The Captain”). I don’t feel bad for Schmidt, necessarily. After all, HE is the one who made the selfish mistake that destroyed his life and the lives of those around him. He has no one to blame but himself. And yet, I UNDERSTAND where Schmidt is coming from. While he’s struggling to make amends with Cece and himself, Schmidt is caught in an identity crisis of his own doing. He’s forced to squeeze into a spot between the person he was to Cece and Elizabeth and the person he always assumed he was. And so he seeks validation in the episode elsewhere in the form of his temple’s rabbi. Meanwhile, Nick gets a delivery from a sketchy former friend of his father’s. In the paper bag is $8,000 of Walt’s estate. Naturally, Nick begins to spend the money on frivolous things while Jess and Winston watch. When Jess asks if they should confront Nick about his spending, Winston dismisses the idea. One thing she should never do, he insists, is bring up the subject of money around Nick. 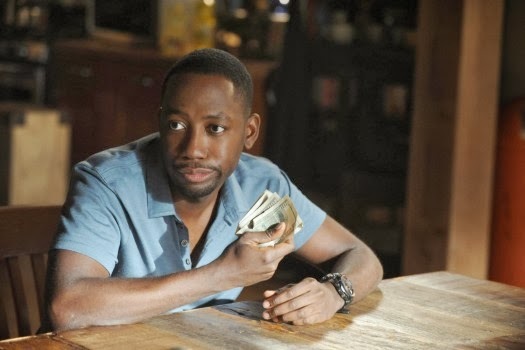 Winston, as it turns out, is waiting to con $1,900 out of Nick that was owed to him and spends most of the episode subtly trying to bring up that fact. Once Nick reveals that he has a box in his closet full of things he doesn’t want to deal with, the wheels in Jess’ mind begin to churn uncontrollably. She and I are a lot alike in this regard: we both want to fix others. I’ve been in friendships and relationships where I’ve tried to “fix” the other person. I’ve tried to condition a behavior out of a friend or will a response from a boyfriend. I often see people as projects, which I think is one of Jess’ greatest flaws (and one of mine too, let’s be honest). Jess’ intentions aren’t unsavory. She’s not setting out to hurt Nick; she’s endeavoring to HELP him. But – as we learn in “The Box” and have learned in previous episodes – just because your intentions begin well does not mean they end that way. Jess soon takes matters into her own hands regarding Nick’s box. And it’s not Jess’ desire to help that is the flaw here, necessarily. It’s the sneaky way that she attempts to accomplish her task, even when Nick instructed her not to help. THAT is the greatest flaw of all. In his rabbi’s office, Schmidt is trying to talk through his struggles. All of his issues boil down to one simple question, he decides: how does he become a better person? The simple answer to Schmidt’s layered question is that he needs to start thinking of others instead of himself. Remember, after all, that all of Schmidt’s issues derive from his selfish motivations and way of thinking. The rabbi continues to explain the concept of selfless living to his befuddled guest: selflessness is thinking about the needs of others and putting their wants above your own. Schmidt doesn’t seem to like this answer. He wants a quick fix, just as he has wanted all along. He wanted the freedom not to choose between Cece and Elizabeth, but that came with a price. And then he wanted the luxury of a painless breakup, but that was not reality. He wants others to suffer – like Nick and Jess – if he is suffering. And he wants to be able to say a few prayers, have someone reassure him, and move forward with his life as if nothing happened. What Schmidt wants isn’t enlightenment or closure, then. What he wants is the feeling of enlightenment and closure without the willingness to do the work and change. On his depressing walk back from the rabbi’s office, Schmidt encounters a bicyclist who has been hit by a car and rushes over to aid the man. He performs the Heimlich maneuver and saves the cyclist who had been choking on his own gum. As he is want to do, Schmidt blows this event out of proportion and takes the man’s gratitude as a sign that he is, indeed, a good person. He saved a choking man on a bicycle, after all! What began as a pure intention – because other people passed by the man on the ground without offering help while Schmidt rushed over – ended up spiraling Schmidt further into his pit of selfishness. Back at the loft, Jess is covertly paying Nick’s bills with his newly acquired money while Winston attempts to con the $1,900 Nick owes out of him. Nick does not take this very well and accuses Winston of slipping out of the “woodword” (is that next to the “wiffy”?) in order to try and get his cut of Walt’s money. Of course, Nick is blowing Winston’s actions out of proportion – as he often does – and then yells at his roommate and demands that he “stay out of his box.” What Nick doesn’t realize, of course, when Jess approaches is that she has been pawing through the box and filing away bills for her boyfriend. Nick’s immediate response to his anger and to situations that frustrate him (and to dealing with emotions of any kind) is to drink. And so – with Jess’ encouragement – he heads to his bar and gets drunk. Meanwhile, Winston discovers that Jess has not only been in Nick’s box, but has organized it and blackmails her into getting him the $1,900 back that Nick owes him. In the bar, Nick is approached by Schmidt and the two have a conversation about what Nick should do with his newly acquired fortune (which – unbeknownst to him – Jess has mostly used to pay his bills). Schmidt suggests that Nick give the money to charity and this makes drunk!Nick happy, so he agrees… only because it “frees [him] of [his] worries.” Ironically, giving away money en masse is something that pacifies Nick. Because the truth is that Nick kind of enjoys being poor, I think. I don’t think that he likes the decisions and responsibility associated with money. He didn’t like the responsibility of ordering balloons and a port-a-potty in “Tinfinity,” for goodness’ sake. If Nick can get rid of the things that worry him, then he doesn’t have to deal with them. Sound familiar? There’s a reason that Nick puts the bag of money in his box, after all. The $8,000 causes him stress because having it means that he has to deal with his bills and his debt and his failures. It forces him to examine his life and choices and what he finds, I’m not sure he likes. At all. And so, much like the deed to a car or the lifeguard certificate, the sack of Walt’s money finds its home in Nick’s box o’ stuff. Because as long as something is hidden in there, it’s hidden from Nick’s immediate memory. But what happens when someone breaks their way into those dark, forgotten places in your life? What happens when someone tries to help you? Nick has either two choices: accept that the person in his life who is trying to break into his physical and emotional box of junk loves and cares about him and wants to work beside him and help heal him or completely shut down and throw up defensive walls to protect himself. Schmidt asks Nick, once more, if he believes that he is a good person. Nick cannot respond and drunkenly asserts that he’s not even sure HE is a good person most days and is therefore unqualified to judge Schmidt. After saving a man’s life, Schmidt presumed everyone would be forced to admit that he is, indeed, a good human being. But when the question is flawed, so is the answer and Schmidt leaves the bar more frustrated than ever with the people around him (but ultimately himself). Jess spends most of the middle of the episode trying to take back the money that she used to pay Nick’s parking tickets and bills. When the man in question returns to the loft and announces that he’s giving away his money and will gladly pay Winston $1,900, Jess and Winston begin to panic with the former rushing into Nick’s room in order to try and burn his box and destroy the evidence (as well as the empty paper bag that had contained all of Walt’s gift to Nick). When Jess admits that she is the one who took Nick’s money to pay some of his bills, the man leaves his room, visibly stung and disappointed in Jess’ actions. Schmidt arrives at a hospital where the injured bicyclist is being treated and delivers flowers to him. While there, Schmidt attempts one more time to get someone in this episode to admit that he is a good person and grows more and more frustrated when the injured man doesn’t immediately respond. But when the bicyclist does admit that Schmidt is a good person, the loft roommate appears visibly relieved. … Until he realizes that the other injured person in the room is a far better human being than he is. This bewilders Schmidt, and he spends the next few moments contemplating what the point of being a good person truly is, anyway, if you could potentially end up damaged or worse. The bicyclist acts as Schmidt’s moral guide, insisting that moral righteousness and integrity is actually one of the most fundamental aspects of a healthy relationship (with both yourself and others). But Schmidt doesn’t like that answer very much and storms out of the hospital room, more lost than ever… and also more frustrated than ever. Back at the loft, Nick and Jess are having one of their classic arguments where they yell at one another about their quirks and habits (all very reminiscent of episodes like “Fluffer”). This argument, however, is rooted in something much more deep and important than anything the two have argued about previously. Nick accuses Jess of trying to fix him (which, again, she DOES attempt to do quite often). He accuses of her of thinking that she knows better than he does (which, again, she DOES most of the time). This visibly stings Jess and it stings us, too. Because in this moment all of Nick’s hurts and hang-ups are laid bare before us and we don’t like what we see. We don’t like that he can be selfish and immature. We think it’s funny when he’s slapping Schmidt or buying a junky port-a-potty, but we t hink it’s a lot less funny when Nick’s throwing Jess’ purses out of the window. And the truth is that Nick doesn’t often realize that he hurts Jess. But when he does… he always makes amends. He visibly sighs when she leaves the room, knowing he crossed a line, and seeks a way to atone for his behavior. Schmidt, meanwhile, reaches a point in “The Box” where he breaks. He questions everything he knows about himself the entire episode and reaches a breaking point as he bursts into a Bar Mitzvah class convincing himself that maybe there is no such thing as a good person or a bad person. Maybe, he reasons, there are only winners and losers. We know this is ludicrous. The rabbi knows this is ludicrous. And you know what? I think Schmidt does, too. I just believe that he reached a point in which he was tired of questioning and scared of where that questioning and self-discovery might lead… so he just stopped trying. And, he decides, if nothing really matters in the end, then he can do whatever he wants and not feel guilt or consequence. Jess gets a call that Nick was attempting to open a checking account at the bank with the check she wrote out to him and the rest of the money in his paper bag. When she approaches, Nick says that he realized something. When Jess asks what he realized, Nick says: “I’d do anything for ya, Jess.” (It’s this sweet sentiment and his soft smile that sends female fans into a puddle of goo.) And truly, Nick realizes that he needs to change. He knows it won’t be easy, but he also knows that he cares so much about Jess that maybe – just maybe – he can show it by how he treats not only her, but himself. And Jess realizes something too, while at the bank: Nick’s irrational anger isn’t always irrational. (SERIOUSLY, PROCESSING FEES ARE THE WORST.) So the couple learns to compromise by seeing a situation from both perspectives. And though Nick won’t always be a model adult and Jess won’t always see from Nick’s perspective, it’s a start. It’s progress. Schmidt appreciates that, genuinely, and accepts Winston’s advice. And I do love, to be honest, that it is WINSTON who provides this advice at the very end of the episode, after he is the one who remained silent when Schmidt asked his question at the beginning of the episode. So maybe there are no “good people” or “bad people.” Perhaps the takeaway here is that everyone has the capability for either good or bad, depending on how we choose to behave. And yes, I just bookended this review with Harry Potter quotes. That slideshow with “You Slider-ed Your Way Into My Heart” had me laughing for a solid minute. The fact that Winston bought a $1,900 candelabra is the best thing ever. Good stuff! I appreciate the Harry Potter reference. I'm baffled as well that many people didn't like this episode. I got a lot out of it and your blog post really brought a lot of that to light for me. I don't understand why people wouldn't have liked this episode. Nick's rant to Jess made me laugh out loud!